The University of Rhode Island Libraries will be offering a public speaker series during the 2018 spring semester to allow students to explore non-traditional employment opportunities. The public speaker series will occur four times before the end of the semester and is coordinated by Associate Libraries Professor Bohyun Kim. 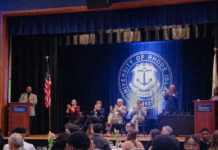 Kim aims to give students in humanities and social sciences a different viewpoint on what they can do with their degree and promote jobs that are available to them in Rhode Island. The four speakers include Karl Aspelund, Andrea Russo, Lisa Carnevale and Nic Schumann. Aspelund is an assistant professor in the Department of Textiles, Fashion Merchandising and Design at the University. Russo works with Microsoft Philanthropies’ technology education and literacy in school’s program. Carnevale is the founder and executive business director of DESIGNxRI, an economic and nonprofit development program for the design sector in Rhode Island. She has also worked as a communications strategist and consultant. Schumann is a programmer and designer who works on problems in the technical realm and has design consultancy experience. Each of the four speakers will share details about their work among the different industries, as well as inform listening students about how their academic background worked for their career. In addition to showing students the numerous areas that they can acquire jobs, Kim hopes to enlighten listeners about where jobs for students with humanities and social sciences degrees can be found. Students will also be given a brief idea about remote management and how they can handle work from anywhere they want. “We are going to talk about where jobs might be, how students can make connections, how to use their capabilities, and relate that back to employers who are looking for students with specific skill sets,” Kim said. Through the speaker series, Kim wanted to showcase the idea that students can acquire jobs that their major may not specifically direct them to. The lectures will be held in an informal setting, allowing students to ask any question they desire. The speakers come from many different backgrounds, with a wide range of skill sets, and Kim hopes that students will be able to learn more about their careers and possible future pathways.